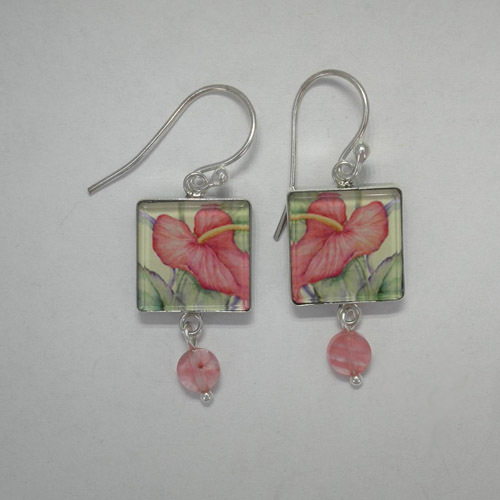 Desc: Sterling Silver enamel Reversible Tropical Beauty dangle earrings. The earrings dangle from French wires. The earrings depict on one side a beautiful Anthurium flower in pastel pinks, yellow, and green enamel. 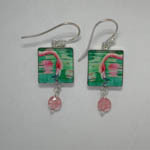 On the opposite side of the earrings is a depiction of a Flamingo head reaching to drink water from a pond. This side of the earrings contains pinks, green, and black enamel. A faceted pink crystal dangles at the base of the earrings. The earrings have bright polish finishes.